Do you love a good Asian Chicken Salad? 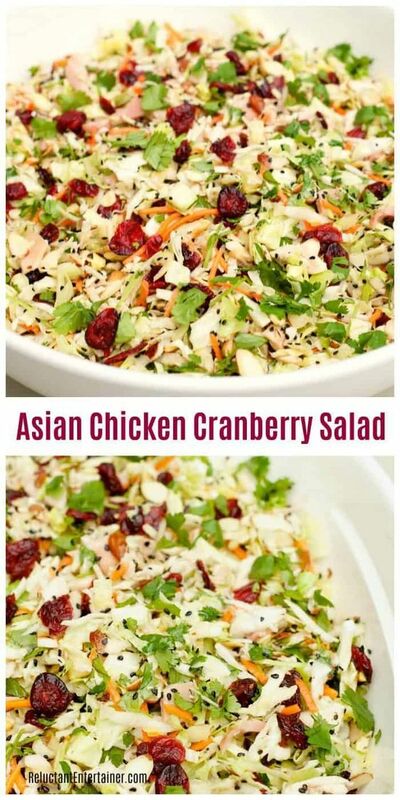 Then you’ll love the flavors of this Asian Chicken Cranberry Salad, a delicious salad or main dish that is popular at any potluck or holiday party! Made with rotisserie chicken, cranberries, sliced almonds, and sesame sticks, the recipe is verstile in so many ways! It’s the perfect dish to take to a party, especially if you double the recipe and serve it in a giant bowl (feeds a crowd). 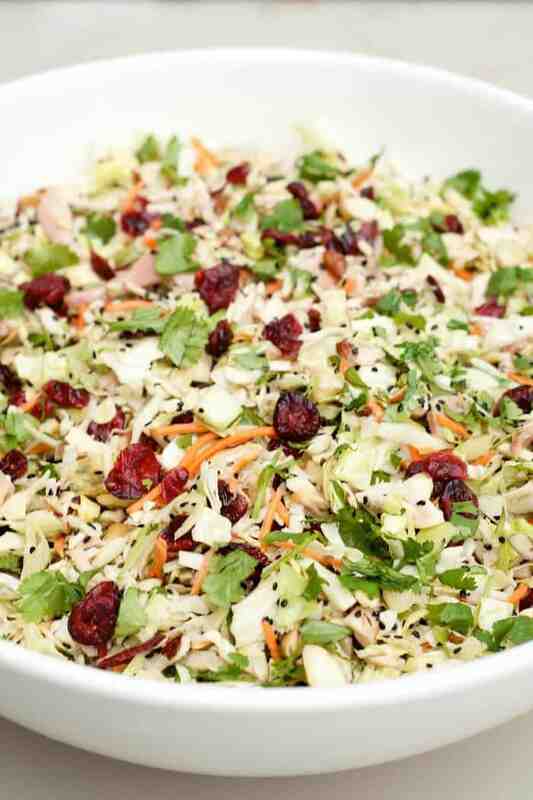 The sweet and tangy dressing with a hint of sesame combined with crisp, thinly chopped cabbage, crunchy, salty sesame sticks, dried orange cranberries, chicken, toasted almonds and plenty of fresh cilantro, makes every bite sensational. Toast almonds by laying on a paper towel and microwaving for 1 minute, turning once. Or, toast the sliced almonds under low broil for 2-3 minutes, until golden brown. You can also make your own cabbage mix with green and purple cabbage with a tiny bit of carrots. Layer the cabbage in a large bowl with chicken, almonds (or cashews, or both), cranberries, red onion, sesame seeds, sesame sticks (optional), and fresh cilantro. Combine the olive oil, balsamic vinegar, soy sauce, garlic, honey, ginger, and sesame oil in a blender. Add 3 tablespoons of water. Process until smooth. 0 Response to "ASIAN CHICKEN CRANBERRY SALAD"